All joking aside. How much do we really know about the food we eat? How do items like fruits and vegetables get to the supermarket? What goes into packaging and processing them so they're safe to eat? Are local foods better? A recent cold spell in the United States has caused produce shortages. My local supermarket has posted signs indicating that the price of certain items, such as strawberries and tomatoes, has increased as a result. Yet the street vendor still seems to have a full stock. He's undoubtedly been affected by the same problem, but his prices haven't fluctuated in the same way. Though he doesn't have the same overhead to manage, he also doesn't have the luxury of raising prices. If he raises prices, he loses customers. And the cost of lost business isn't something he might readily recover from. The supermarket can recoup its losses from low produce sales via other products and still cover overhead and staff, but the same isn't true for the fruit vendor. The image of the vendor sitting his folding chair stayed with me though. Like others, I have begun to think more and more about my "carbon food print": where my food comes from, and the costs—both to my wallet and the environment—of my choices. (Though I have to admit that I'm not giving up hamburgers just yet.) The idea behind the carbon food print is similar to the carbon footprint: it looks at the resources required to grow and transport food from the farm to your refrigerator. A result of this growing awareness has been a movement encouraging people to purchase locally grown produce. Luckily Long Island has a thriving farm community so produce like spinach, broccoli, apples, strawberries, and peaches are easy to obtain from local sources. And I don't have to travel far to take advantage of this either: my supermarket supports local growers at no real premium to me. Still, despite local efforts, certain fruits must be trucked/flown in. 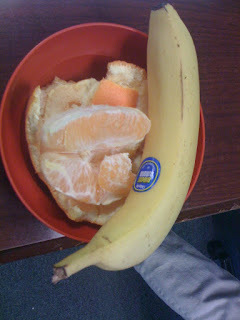 Oranges, for example, are difficult to grow in the Northern United States. It's certainly possible, but they'd require additional resources to survive colder temperatures. Unless you've got a giant greenhouse handy, and the funds to keep it running, it's probably not worth it. So in terms of making a greener purchase, whether you buy your oranges from the supermarket or the street vendor makes no difference—they've both likely had to get the oranges from a non-local source. On the other hand, if concern over the origin of food is an issue, it seems to make sense to buy apples from the supermarket where you can be sure that they came from a local orchard. There's no guarantee that the street vendor purchased his apples locally—he may be relying on a third party to get him his fruit, which also adds another layer to the to the whole carbon food print picture. The authors suggest that eating less red meat and/or dairy products may be a more effective way for concerned citizens to lower their food-related climate impacts. They estimate that shifting to an entirely local diet would reduce the equivalent greenhouse gas emissions as driving 1,000 miles, while changing only one day per week's meat and dairy-based calories to chicken, fish, or vegetables would have about the same impact. Shifting entirely from an average American diet to a vegetable-based one would reduce the same emissions as 8,000 miles driven per year. Where do you get your fruit from? Do you or have you been thinking about your carbon food print? 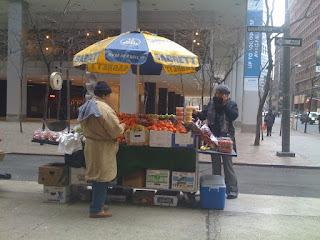 And would you buy fruit from a mobile vendor?